Chameleons are one of nature’s most fascinating and unusual animals. They are well known for a variety of impressive physical attributes, but there’s more to this specialized tree lizard than his ability to change color, move his eyes independently or grip a branch with his tail. Their global distribution, mating habits and behavior are equally as fascinating. Number of Species : Over 80 species of chameleon inhabit the warm arboreal areas of Yemen and the Arabian Peninsula. However, over half of the world’s chameleons live on the African island of Madagascar. 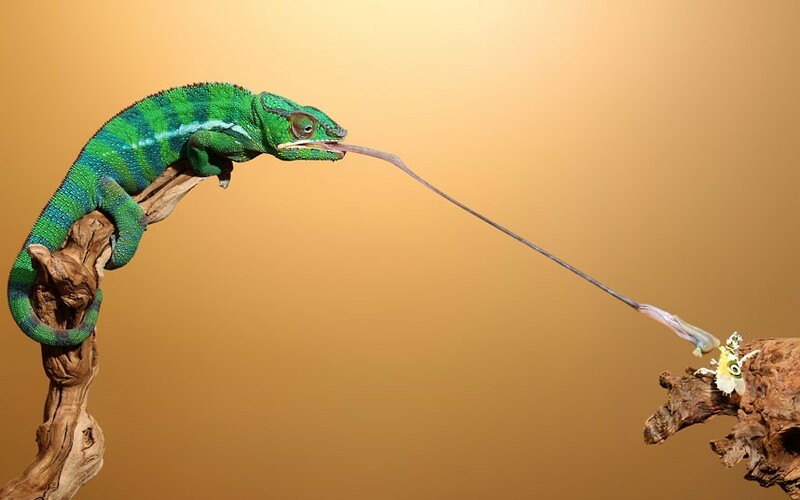 Tongue: The chameleon’s long tongue, which he uses to catch unsuspecting insects, can be equal to half of his entire body length. The tongue is sticky and enables him to pluck his prey from distance. 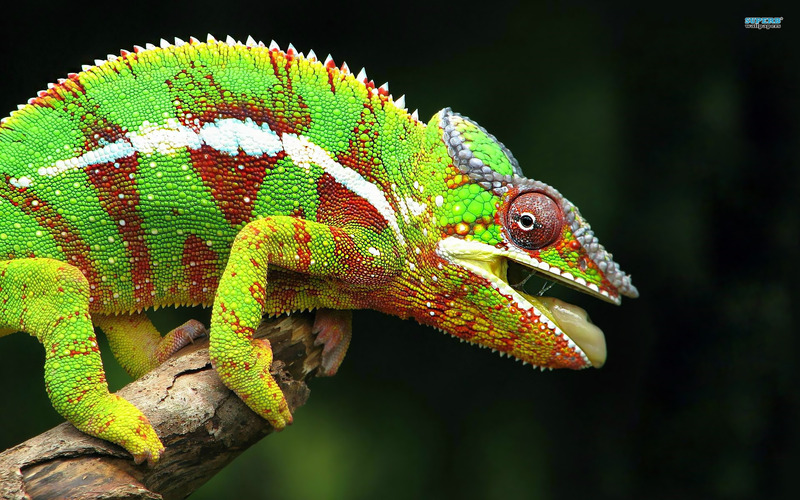 Color Changing : The ability to change color is perhaps the most notable characteristic of chameleons. Although they use this incredible talent to camouflage themselves, the main purpose of changing color is to convey their mood. Independent Eye Movement : Chameleons can move both eyes independently, enabling them to enjoy a full 360-degree panorama of their surroundings. This is perfect for hunting. They can also rotate and swivel their eyes in the socket. This incredible talent enables them to observe two things, in different directions, at the same time. Hands: Chameleons’ hands are remarkably similar to our own, but with fewer fingers. They have three fingers that they use for gripping branches. Balance : Chameleons have fantastic balance, enabling them to climb trees and hunt with impressive dexterity. They use their tail and hands to distribute their weight across fragile tree branches. They can even sleep upside down. Interaction: All chameleons live alone, only tolerating the presence of other chameleons during mating season. Males can be very territorial and can become aggressive if other chameleons enter their turf. Diet: Chameleons are insectivores, favoring crickets and bugs as their primary food source. During dry season, they eat leaves to get water. Mating: intimate maturity typically happens at around 4 months of age, when the chameleon is between 8 and 12 inches. They mate up to three times a year, and females lay their eggs between 20 and 30 days after a successful mating. It’s obvious when the female is pregnant because she changes color around 18 hours after being impregnated. Life Span: Female chameleons can live to be 5 years old in the wild, while males can live to age 8.